Ever since Prime Minister Hun Sen asked the United Nations for help in constructing a legal process capable of putting surviving leaders of the dreaded Khmer Rouge in the dock, Cambodia’s war crimes tribunal has never been far from controversy. Independent observers often complained the shrill voice of court critics have often drowned out the substance produced inside the court. Allegations of government interference and funding issues were serious and at times threatened the existence of the Extraordinary Chambers for the Courts in Cambodia (ECCC). But of much greater importance was the light shed upon one of the great travesties of the 20th century. Surviving leaders of the Khmer Rouge this week stood defiant before the international court and gave a spirited defense against charges of crimes against humanity, arguing they had no case to answer over the deaths of two million people. They requested an acquittal and asked to be released. 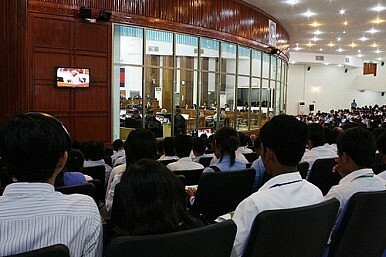 In closing arguments on the final day of the current Khmer Rouge trial, former Brother Number Two and the communist party chief ideologue Nuon Chea, 87, blamed the government in Hanoi, as well as Vietnamese and American infiltrators, for atrocities committed here during their 1975-79 rule and the period that followed, when the country was occupied by Vietnamese troops. “We failed to realize the depth of Vietnamese trickery,” he said, occasionally slipping into communist language more commonly associated with the Cold War. Absent were his trademark gangster-like sunglasses as Nuon Chea hoped to distance himself from allegations surrounding the forced evacuation of Phnom Penh after Pol Pot seized control of the capital on April 17, 1975 and the ensuing slaughter of soldiers and civilians linked to the former Lon Nol regime. Nuon Chea said that he and the Khmer Rouge were not responsible for the killings, nor deaths attributed to starvation and forced labor. His terse arguments were supported by the former head of state Khieu Samphan, 82, who added that he was powerless to intervene. Both men expressed their sympathies for the victims, apologized and accepted moral responsibility for what happened – but denied they had any direct knowledge or responsibility for the carnage. Nuon Chea said the testimony offered by witnesses was “littered with doubts and full of lies,” particularly evidence offered by Kaing Guek Eav, alias Duch, who has already been sentenced to life behind bars for the deaths of 12,000 people proceed at the S-21 torture and extermination center. “He is full of anger and feels hopeless in life and wanted me to serve a life sentence like him,” Nuon Chea said of Duch. Duch had testified that Nuon Chea was indeed his chief and that he was fully aware of the carnage taking place across the country. Surviving leaders at current hearings before the Extraordinary Chambers for the Courts in Cambodia (ECCC) have been charged with crimes against humanity for the evacuation and execution of those linked to the former Lon Nol regime at Tuol Po Chrey. The final day was a vintage performance at what could be the last hearings of the controversial tribunal, which has been plagued by funding issues and allegations of political interference. Further charges are pending and lower ranked cadre have been earmarked for further trial, however, a lack of funding and political will has cast doubts over any further hearings. Sources close to the ECCC say any more prosecutions are unlikely. The court was earlier told how bodies littered the roads out of the city during the evacuation. Women who had just given birth were marched out of hospital alongside sick patients. Those earmarked for killing were handcuffed and clubbed at a rate of up to 800 in a day. Others were shot in rotation of up to 40 at a time after being told they were to be transported to a camp for educational studies. Desirable young girls were given as trophy brides to favored cadre and troops who had been permanently wounded in combat. Those women who denied their husbands conjugal rights were exterminated. Muslims were forced to eat pork and marry non-Muslims. Intellectuals, often singled out because they wore glasses, were slaughtered alongside ethnic Vietnamese and Muslim Chams. The court also heard how Nuon Chea failed to intervene on behalf of his own nieces, Lach Vary and Lach Dara. The girls were doctors trained in China who were put to death. Throughout the trial, both men appeared confident. Nuon Chea gave testimony seated in a wheelchair after being escorted into the dock. He then spent the final hours of the hearing listening to Khieu Samphan speak from a specially prepared cell built in the basement of the ECCC. Khieu Samphan also said he had been portrayed as a monster and as a coward but added that he had a deep regret that the court would not afford him a proper opportunity to explain himself. A verdict is expected in mid-2014. Hearings in the next case against surviving leaders of the Pol Pot regime are expected to begin later this year.